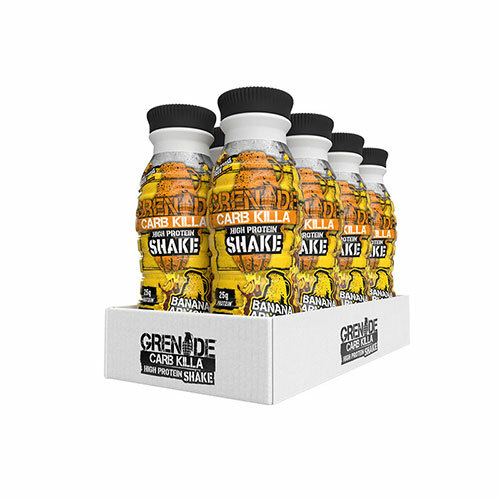 Following on from the global success of the iconic Carb Killa® Bars, Carb Killa® Shake is a smooth and creamy 'on the go' high protein shake. Delivering over 24 grams of protein per shake, it is a high protein treat that has been designed to provide balanced complete sources of protein. Unlike many other shakes and smoothies, it is low in sugar so ideal for those on a low carb diet and avoiding processed carbs. Consume at any time during the day. Best served chilled. Shake well and enjoy as a part of a balanced diet and a healthy lifestyle. Try pouring on cereal as an alternative to milk or over your favourite dessert instead of cream.